Its model number and name are #021 / King Shark. Character Bio - Mutation, highly evolved animal, or son of the shark god? King Shark's origins are mysterious, as are his allegiances. An enemy of Superboy then later a reluctant ally, King Shark has also been a mentor to Aquaman and a member of both the Suicide Squad and the Secret Six. What's not mysterious about King Shark is where he can be found: in the midst of battle, wherever the scent of blood is in the water. As an Outlaw, King Shark has these Outlaw Synergies. As a figure with the Super Strength special power, King Shark cannot be affected by aspects of certain special powers. Current Special Powers that Interact Differently with the Super Strength special power. 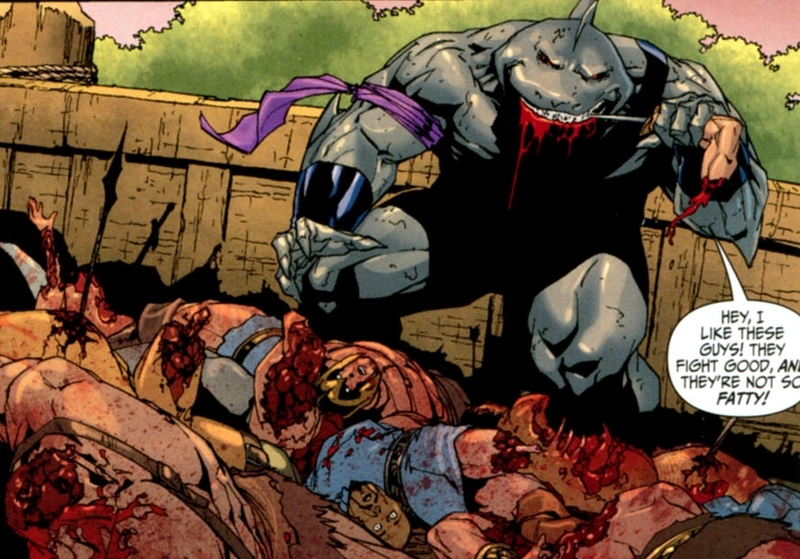 As a figure with the Super Strength special power, King Shark interacts differently with certain special powers. Current Special Powers that Interact Differently with the Super Strength special power. Last edited by Ronin; November 5th, 2017 at 03:46 PM. King Shark does not stop his movement when entering a water space. Add 1 die to King Shark's attack and defense while he is on a water space. When King Shark attacks, he receives 1 extra attack die for each Wound Marker on the defending figure’s Army Card, to a maximum of 3 additional attack dice for Feeding Frenzy. When King Shark destroys a figure with his normal attack, he must attack again. King Shark must continue attacking with his normal attack until he does not destroy a figure. Last edited by TrollBrute; April 4th, 2015 at 09:32 PM. Last edited by TrollBrute; March 18th, 2015 at 01:47 PM. Looks good to me. This is a pretty straightforward one. There's a few ways you could get the theme of Feeding Frenzy across, but I think this is a solid one. Might want to specify normal attack in the first part of Feeding Frenzy. We'll have to keep a close eye on him in testing, the potential for 10 attack dice and multiple attacks is scary. He'll love being paired with Tempest. Should he really be hitting as hard (harder in water) as Superman? Water Strength adding to everything else frightens me a bit. How about we do something like this instead? King Shark does not stop his movement when entering a water space. Add 2 to King Shark's Move if he begins his turn on a water space. Eh, we already have units like Tiger Shark who has 7 attack, 7 defense, and Water Strength 1, and Aquaman (I) who has 6 attack, 5 defense, and Power of the Deep. 5 attack, 5 defense and Water Strength 2 isn't that scary in my opinion. I do find his potential for 10 attack a bit much though, I wouldn't mind seeing Feeding Frenzy cap at +2. 10 Attack does worry me a little. I almost dropped Water Strength to 1 when I posted it. Getting to 10 does require being on a water space adjacent to a Hero with 3+ wound markers on it, so it's not exactly an easy feat. I'd be fine with dropping Water Strength down 1 and/or lowering the boost from Feeding Frenzy or lowering his base Attack by 1. I wouldn't want to go too low though, dude is a super-powered, demi-god shark. I don't mind adding it, but it's not really necessary. He doesn't have a Special Attack, and SAs are never modified anyway. I don't know, most water spaces are either near the center of the map, or on the outside. Meaning he doesn't need the boost or he would have to move outside the battle just to get a boost moving back in. I would rather lower the boosts from his other powers first. Ahh, a character I've been expecting for a long, long time. King Shark does not stop his movement when entering a water space. Add 1 to King Shark's attack and defense while he is on a water space. When attacking with King Shark, he receives 1 extra attack die for each Wound Marker on the defending figure’s Army Card, to a maximum of 3 additional attack dice for Feeding Frenzy. When King Shark destroys an opponent's figure with his normal attack, he may attack again. King Shark may continue attacking with his normal attack until he does not destroy a figure.